Audrey Hepburn (/ˈɔːdri ˈhɛpˌbɜːrn/; born Audrey Kathleen Ruston; 4 May 1929 – 20 January 1993) was a British actress, model, dancer and humanitarian. Recognized as a film and fashion icon, Hepburn was active during Hollywood's Golden Age. She was ranked by the American Film Institute as the third-greatest female screen legend in Golden Age Hollywood and was inducted into the International Best Dressed List Hall of Fame. Born in Ixelles, a district of Brussels, Hepburn spent her childhood between Belgium, England and the Netherlands. In Amsterdam, she studied ballet with Sonia Gaskell before moving to London in 1948, continuing her ballet training with Marie Rambert, and then performing as a chorus girl in West End musical theatre productions. Following minor appearances in several films, Hepburn starred in the 1951 Broadway play Gigi after being spotted by French novelist Colette, on whose work the play was based. She shot to stardom for playing the lead role in Roman Holiday (1953), for which she was the first actress to win an Academy Award, a Golden Globe and a BAFTA Award for a single performance. The same year Hepburn won a Tony Award for Best Lead Actress in a Play for her performance in Ondine. She went on to star in a number of successful films, such as Sabrina (1954), The Nun's Story (1959), Breakfast at Tiffany's (1961), Charade (1963), My Fair Lady (1964) and Wait Until Dark (1967), for which she received Academy Award, Golden Globe and BAFTA nominations. Hepburn won a record three BAFTA Awards for Best British Actress in a Leading Role. In recognition of her film career, she was awarded the Lifetime Achievement Award from BAFTA, the Golden Globe Cecil B. DeMille Award, the Screen Actors Guild Life Achievement Award and the Special Tony Award. She remains one of the 12 people who have won Academy, Emmy, Grammy and Tony Awards. Hepburn was born Audrey Kathleen Ruston or Edda Kathleen Hepburn-Ruston on 4 May 1929 at number 48 Rue Keyenveld in Ixelles, a municipality in Brussels, Belgium. Her father, Joseph Victor Anthony Ruston (1889–1980), was a British subject born in Auschitz, Bohemia, Austria-Hungary. [lower-alpha 1] He was the son of Victor John George Ruston, of British and Austrian descent and Anna Wels, of Austrian descent. In 1923-24 Joseph had briefly been an honorary British consul in Samarang in the Dutch East Indies and prior to his marriage to Hepburn's mother he had been married to Cornelia Bisschop, a Dutch heiress. Although born with the surname Ruston, he later double-barrelled his name to the more "aristocratic" Hepburn-Ruston, mistakenly believing himself descended from James Hepburn, third husband of Mary, Queen of Scots. Hepburn's mother, Ella van Heemstra (1900–1984), was a Dutch baroness. She was the daughter of Baron Aarnoud van Heemstra, who served as mayor of Arnhem from 1910 to 1920 and as Governor of Dutch Suriname from 1921 to 1928, and Elbrig Willemine Henriette, Baroness van Asbeck (1873–1939). At age nineteen, Ella had married Jonkheer Hendrik Gustaaf Adolf Quarles van Ufford, an oil executive based in Batavia, Dutch East Indies, where they subsequently lived. They had two sons, Jonkheer Arnoud Robert Alexander Quarles van Ufford (1920–1979) and Jonkheer Ian Edgar Bruce Quarles van Ufford (1924–2010), before divorcing in 1925. Hepburn's parents were married in Batavia in September 1926. At the time, Ruston worked for a trading company, but soon after the marriage, the couple relocated to Europe, where he began working for a loan company. After a year in London, they moved to Brussels, where he had been assigned to open a branch office. After three years spent travelling between Brussels, Arnhem, The Hague and London, the family settled in the suburban Brussels municipality of Linkebeek in 1932. Hepburn's early childhood was sheltered and privileged. As a result of her multinational background and travelling with her family due to her father's job,[lower-alpha 2] she learned to speak five languages: Dutch and English from her parents, and later French, Spanish, and Italian. After Britain declared war on Germany in September 1939, Hepburn's mother relocated her daughter back to Arnhem in the hope that, as during World War I, the Netherlands would remain neutral and be spared a German attack. While there, Hepburn attended the Arnhem Conservatory from 1939 to 1945. She had begun taking ballet lessons during her last years at boarding school, and continued training in Arnhem under the tutelage of Winja Marova, becoming her "star pupil". After the Germans invaded the Netherlands in 1940, Hepburn used the name Edda van Heemstra, because an "English-sounding" name was considered dangerous during the German occupation. Her family was profoundly affected by the occupation, with Hepburn later stating that "had we known that we were going to be occupied for five years, we might have all shot ourselves. We thought it might be over next week ... six months ... next year ... that's how we got through". In 1942, her uncle, Otto van Limburg Stirum (husband of her mother's older sister, Miesje), was executed in retaliation for an act of sabotage by the resistance movement; while he had not been involved in the act, he was targeted due to his family's prominence in Dutch society. Hepburn's half-brother Ian was deported to Berlin to work in a German labour camp, and her other half-brother Alex went into hiding to avoid the same fate. "We saw young men put against the wall and shot, and they'd close the street and then open it and you could pass by again...Don't discount anything awful you hear or read about the Nazis. It's worse than you could ever imagine." After her uncle's death, Hepburn, Ella and Miesje left Arnhem to live with her grandfather, Baron Aarnoud van Heemstra, in nearby Velp. It was long believed that during this time, Hepburn participated in the Dutch resistance. In 2016, the Airborne Museum 'Hartenstein' reported that after extensive research it had not found any evidence of such activities. In addition to other traumatic events, she witnessed the transportation of Dutch Jews to concentration camps, later stating that "more than once I was at the station seeing trainloads of Jews being transported, seeing all these faces over the top of the wagon. I remember, very sharply, one little boy standing with his parents on the platform, very pale, very blond, wearing a coat that was much too big for him, and he stepped on the train. I was a child observing a child." After the Allied landing on D-Day, living conditions grew worse and Arnhem was subsequently heavily damaged during Operation Market Garden. During the Dutch famine that followed in the winter of 1944, the Germans blocked the resupply routes of the Dutch people's already-limited food and fuel supplies as retaliation for railway strikes that were held to hinder German occupation. Like others, Hepburn's family resorted to making flour out of tulip bulbs to bake cakes and biscuits; she developed acute anæmia, respiratory problems and edema as a result of malnutrition. The van Heemstra family was also seriously financially affected by the occupation, during which many of their properties, including their principal estate in Arnhem, were badly damaged or destroyed. The Allies liberated the Netherlands in May 1945, with the United Nations Relief and Rehabilitation Administration beginning the distribution of food and other essentials. After the war ended in 1945, Hepburn moved with her mother and siblings to Amsterdam, where she began ballet training under Sonia Gaskell, a leading figure in Dutch ballet, and Russian Olga Tarassova. As the family's fortunes had been lost during the war, Ella supported them by working as a cook and housekeeper for a wealthy family. Hepburn made her film debut in 1948, playing an air stewardess in Dutch in Seven Lessons, an educational travel film made by Charles van der Linden and Henry Josephson. Later that year, she moved to London to take up a ballet scholarship with Ballet Rambert, which was then based in Notting Hill. [lower-alpha 3] She supported herself with part-time work as a model, and dropped "Ruston" from her surname. After she was told by Rambert that despite her talent, her height and weak constitution (the after-effect of wartime malnutrition) would make the status of prima ballerina unattainable, she decided to concentrate on acting. While Ella worked in menial jobs to support them, Hepburn appeared as a chorus girl in the West End musical theatre revues High Button Shoes (1948) at the London Hippodrome, and Cecil Landeau's Sauce Tartare (1949) and Sauce Piquante (1950) at the Cambridge Theatre. During her theatrical work, she took elocution lessons with actor Felix Aylmer to develop her voice. After being spotted by a casting director while performing in Sauce Piquante, Hepburn was registered as a freelance actress with the Associated British Picture Corporation. She appeared in minor roles in the 1951 films One Wild Oat, Laughter in Paradise, Young Wives' Tale and The Lavender Hill Mob, before being cast in her first major supporting role in Thorold Dickinson's The Secret People (1952), in which she played a prodigious ballerina, performing all of her own dancing sequences. Hepburn was then offered a small role in a film being shot in both English and French, Monte Carlo Baby (French:Nous Irons à Monte Carlo,1952), which was filmed in Monte Carlo. Coincidentally, French novelist Colette was at the Hôtel de Paris in Monte Carlo during the filming, and decided to cast Hepburn in the title role in the Broadway play Gigi. Hepburn went into rehearsals having never spoken on stage and required private coaching. When Gigi opened at the Fulton Theatre on 24 November 1951, she received praise for her performance, despite criticism that the stage version was inferior to the French filmatisation. Life called her a "hit", while The New York Times stated that "her quality is so winning and so right that she is the success of the evening". She also received a Theatre World Award for the role. The play ran for 219 performances, closing on 31 May 1952, before going on tour which began 13 October 1952 in Pittsburgh and visited Cleveland, Chicago, Detroit, Washington D.C. and Los Angeles before closing on 16 May 1953 in San Francisco. Hepburn had her first starring role in Roman Holiday (1953), playing Princess Anne, a European princess who, while escaping the reins of royalty, falls in love with an American newsman (Gregory Peck). Its producers initially wanted Elizabeth Taylor for the role, but director William Wyler was so impressed by Hepburn's screen test that he cast her instead. Wyler later commented, "She had everything I was looking for: charm, innocence, and talent. She also was very funny. She was absolutely enchanting and we said, 'That's the girl!'" Originally, the film was to have had only Gregory Peck's name above its title, with "Introducing Audrey Hepburn" beneath in smaller font. However, Peck suggested to Wyler that he elevate her to equal billing so that her name appeared before the title and in type as large as his: "You've got to change that because she'll be a big star and I'll look like a big jerk." Hepburn also returned to the stage in 1954, playing a water spirit who falls in love with a human in the fantasy play Ondine on Broadway. A New York Times critic commented that "somehow Miss Hepburn is able to translate [its intangibles] into the language of the theatre without artfulness or precociousness. She gives a pulsing performance that is all grace and enchantment, disciplined by an instinct for the realities of the stage". Her performance won her the 1954 Tony Award for Best Performance by a Leading Actress in a Play the same year she won the Academy Award for Roman Holiday, making her one of three actresses to receive the Academy and Tony Awards for Best Actress in the same year (the other two are Shirley Booth and Ellen Burstyn). During the production, Hepburn and her co-star Mel Ferrer began a relationship, and were married on 25 September 1954 in Switzerland. Although she appeared in no new film releases in 1955, Hepburn received the Golden Globe for World Film Favorite that year. Having become one of Hollywood's most popular box-office attractions, she went on to star in a series of successful films during the remainder of the decade, including her BAFTA- and Golden Globe-nominated role as Natasha Rostova in War and Peace (1956), an adaptation of the Tolstoy novel set during the Napoleonic wars, starring Henry Fonda and her husband Mel Ferrer. 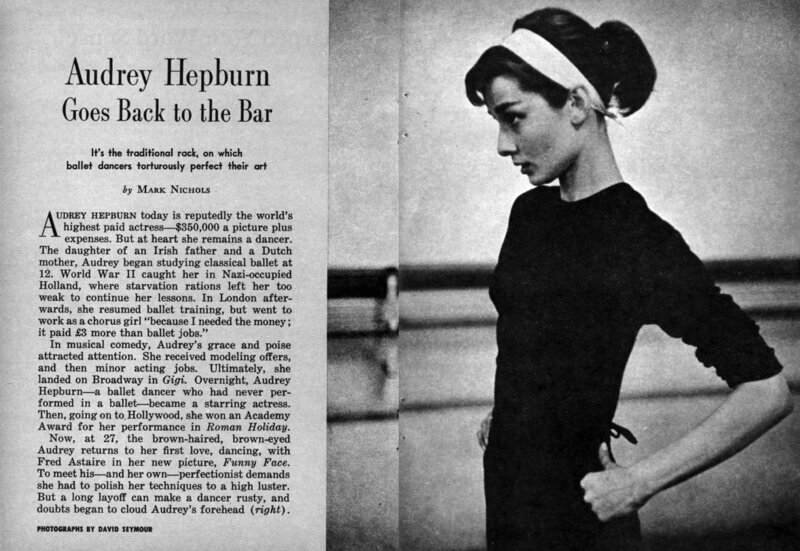 In 1957, she exhibited her dancing abilities in her debut musical film, Funny Face (1957) wherein Fred Astaire, a fashion photographer, discovers a beatnik bookstore clerk (Hepburn) who, lured by a free trip to Paris, becomes a beautiful model. The same year Hepburn starred in another romantic comedy, Love in the Afternoon, alongside Gary Cooper and Maurice Chevalier. 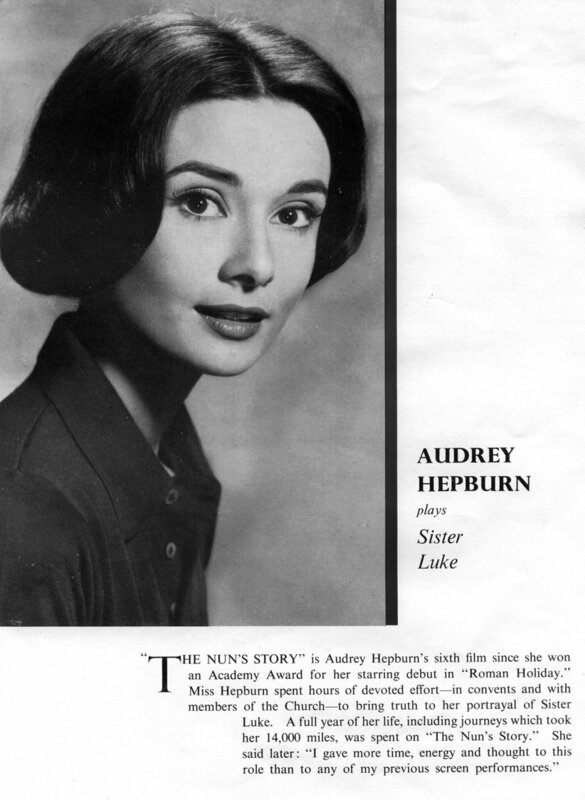 Hepburn played Sister Luke in The Nun's Story (1959), which focuses on the character's struggle to succeed as a nun, alongside co-star Peter Finch. The role produced a third Academy Award nomination for Hepburn and earned her a second BAFTA Award. A review in Variety read, "Hepburn has her most demanding film role, and she gives her finest performance", while Films in Review stated that her performance "will forever silence those who have thought her less an actress than a symbol of the sophisticated child/woman. Her portrayal of Sister Luke is one of the great performances of the screen." Reportedly, she spent hours in convents and with members of the Church to bring truth to her portrayal, stating that she "gave more time, energy and thought to this than to any of my previous screen performances." Hepburn next starred as New York call girl Holly Golightly in Blake Edwards's Breakfast at Tiffany's (1961), a film loosely based on the Truman Capote novella of the same name. Capote disapproved of many changes that were made to sanitise the story for the film adaptation, and would have preferred for Marilyn Monroe to have been cast in the role, although he also stated that Hepburn "did a terrific job". The character is considered one of the best-known in American cinema, and a defining role for Hepburn. The dress she wears during the opening credits is considered an icon of the twentieth century and perhaps the most famous "little black dress" of all time. Hepburn stated that the role was "the jazziest of my career" yet admitted: "I'm an introvert. Playing the extroverted girl was the hardest thing I ever did." She was nominated for an Academy Award for Best Actress for her performance. The same year, Hepburn also starred in William Wyler's controversial drama The Children's Hour (1961), in which she and Shirley MacLaine played teachers whose lives become troubled after a student accuses them of being lesbians. Due to the social mores of the time, the film and Hepburn's performance went largely unmentioned, both critically and commercially. Bosley Crowther of The New York Times opined that the film "is not too well acted" with the exception of Hepburn who "gives the impression of being sensitive and pure" of its "muted theme", while Variety magazine also complimented Hepburn's "soft sensitivity, mar-velous [sic] projection and emotional understatement" adding that Hepburn and MacLaine "beautifully complement each other". Hepburn next appeared opposite Cary Grant in the comic thriller Charade (1963), playing a young widow pursued by several men who chase the fortune stolen by her murdered husband. 59-year-old Grant, who had previously withdrawn from the starring male lead roles in Roman Holiday and Sabrina, was sensitive about his age difference with 34-year-old Hepburn, and was uncomfortable about the romantic interplay. To satisfy his concerns, the filmmakers agreed to change the screenplay so that Hepburn's character romantically pursued his. The film turned out to be a positive experience for him, stating that "All I want for Christmas is another picture with Audrey Hepburn." The role earned Hepburn her third and final competitive BAFTA Award and another Golden Globe nomination. Critic Bosley Crowther was less kind to her performance, stating that "Hepburn is cheerfully committed to a mood of how-nuts-can-you-be in an obviously comforting assortment of expensive Givenchy costumes." Hepburn reteamed with her Sabrina co-star William Holden in Paris When It Sizzles (1964), a screwball comedy in which she played the young assistant of a Hollywood screenwriter, who aids his writer's block by acting out his fantasies of possible plots. Its production was troubled by a number of problems. Holden unsuccessfully tried to rekindle a romance with the now-married Hepburn, and his alcoholism was beginning to affect his work. After principal photography began, she demanded the dismissal of cinematographer Claude Renoir after seeing what she felt were unflattering dailies. Superstitious, she also insisted on dressing room 55 because that was her lucky number and required that Givenchy, her long-time designer, be given a credit in the film for her perfume. Dubbed "marshmallow-weight hokum" by Variety upon its release in April, the film was "uniformly panned" but critics were kinder to Hepburn's performance, describing her as "a refreshingly individual creature in an era of the exaggerated curve". The press further played up the fabricated rivalry between Hepburn and Andrews, when the latter won an Academy Award for Mary Poppins at the 37th Academy Awards (1964) but Hepburn was not even nominated, despite My Fair Lady's accumulation of eight out of a possible twelve awards. Regardless, critics greatly applauded Hepburn's "exquisite" performance. Crowther wrote that "the happiest thing about [My Fair Lady] is that Audrey Hepburn superbly justifies the decision of Jack Warner to get her to play the title role." 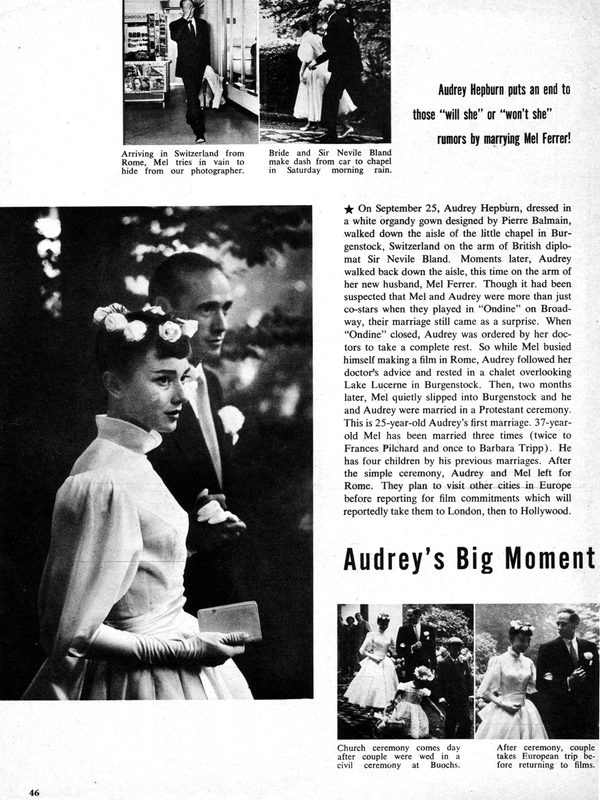 Gene Ringgold of Soundstage also commented that "Audrey Hepburn is magnificent. She is Eliza for the ages", while adding, "Everyone agreed that if Julie Andrews was not to be in the film, Audrey Hepburn was the perfect choice." After 1967, Hepburn chose to devote more time to her family and acted only occasionally in the following decades. She attempted a comeback in 1976, co-starring with Sean Connery in the period piece Robin and Marian, which was moderately successful. In 1979, Hepburn reunited with director Terence Young in the production of Bloodline, sharing top-billing with Ben Gazzara, James Mason and Romy Schneider. The film, an international intrigue amid the jet-set, was a critical and box-office failure. Hepburn's last starring role in a feature film was opposite Gazzara in the comedy They All Laughed (1981), directed by Peter Bogdanovich. The film was overshadowed by the murder of one of its stars, Dorothy Stratten, and received only a limited release. Six years later, Hepburn co-starred with Robert Wagner in a made-for-television caper film, Love Among Thieves (1987). In the 1950s, Hepburn narrated two radio programmes for UNICEF, re-telling chldren's stories of war. In 1989, Hepburn was appointed a Goodwill Ambassador of UNICEF. On her appointment, she stated that she was grateful for receiving international aid after enduring the German occupation as a child, and wanted to show her gratitude to the organisation. In August 1988 Hepburn went to Turkey on an immunisation campaign. She called Turkey "the loveliest example" of UNICEF's capabilities. Of the trip, she said "the army gave us their trucks, the fishmongers gave their wagons for the vaccines, and once the date was set, it took ten days to vaccinate the whole country. Not bad." In October, Hepburn went to South America. Of her experiences in Venezuela and Ecuador, Hepburn told the United States Congress, "I saw tiny mountain communities, slums, and shantytowns receive water systems for the first time by some miracle – and the miracle is UNICEF. I watched boys build their own schoolhouse with bricks and cement provided by UNICEF." In October 1990 Hepburn went to Vietnam, in an effort to collaborate with the government for national UNICEF-supported immunisation and clean water programmes. In September 1992, four months before she died, Hepburn went to Somalia. Calling it "apocalyptic", she said, "I walked into a nightmare. I have seen famine in Ethiopia and Bangladesh, but I have seen nothing like this – so much worse than I could possibly have imagined. I wasn't prepared for this. "Though scarred by what she had seen, Hepburn still had hope. "Taking care of children has nothing to do with politics. I think perhaps with time, instead of there being a politicisation of humanitarian aid, there will be a humanisation of politics." United States president George H. W. Bush presented Hepburn with the Presidential Medal of Freedom in recognition of her work with UNICEF, and the Academy of Motion Picture Arts and Sciences posthumously awarded her the Jean Hersholt Humanitarian Award for her contribution to humanity. In 2002, at the United Nations Special Session on Children, UNICEF honoured Hepburn's legacy of humanitarian work by unveiling a statue, "The Spirit of Audrey", at UNICEF's New York headquarters. Her service for children is also recognised through the US Fund for UNICEF's Audrey Hepburn Society. Hepburn met her second husband, Italian psychiatrist Andrea Dotti, on a Mediterranean cruise with friends in June 1968. She believed she would have more children and possibly stop working. They married on 18 January 1969; their son, Luca Dotti, was born on 8 February 1970. While pregnant with Luca in 1969, Hepburn was more careful, resting for months before delivering the baby via caesarean section. She wanted to have a third child, but had another miscarriage in 1974. Although Dotti loved Hepburn and was well-liked by Sean, he was unfaithful. She also had a romantic relationship with actor Ben Gazzara during the filming of the 1979 movie Bloodline. The Dotti-Hepburn marriage lasted thirteen years and was dissolved in 1982. "How shall I sum up my life? I think I've been particularly lucky." Audrey Hepburn's legacy has endured long after her death. The American Film Institute named Hepburn third among the Greatest Female Stars of All Time. She is one of few entertainers who have won Academy, Emmy, Grammy and Tony Awards. She won a record three BAFTA Awards for Best British Actress in a Leading Role. In her last years, she remained a visible presence in the film world. She received a tribute from the Film Society of Lincoln Center in 1991 and was a frequent presenter at the Academy Awards. She received the BAFTA Lifetime Achievement Award in 1992. She was the recipient of numerous posthumous awards including the 1993 Jean Hersholt Humanitarian Award and competitive Grammy and Emmy Awards. She has been the subject of many biographies since her death including the 2000 dramatisation of her life titled The Audrey Hepburn Story which starred Jennifer Love Hewitt and Emmy Rossum as the older and younger Hepburn respectively. In January 2009, Hepburn was named on The Times’ list of the top 10 British actresses of all time. Hepburn was noted for her fashion choices and distinctive look, to the extent that journalist Mark Tungate has described her as a recognisable brand. When she first rose to stardom in Roman Holiday (1953), she was seen as an alternative feminine ideal that appealed more to women than to men, in comparison to the curvy and more sexual Grace Kelly and Elizabeth Taylor. With her short hair style, thick eyebrows, slim body and "gamine" looks, she presented a look which young women found easier to emulate than those of more sexual film stars. In 1954, fashion photographer Cecil Beaton declared Hepburn the "public embodiment of our new feminine ideal" in Vogue, and wrote that "Nobody ever looked like her before World War II ... Yet we recognize the rightness of this appearance in relation to our historical needs. The proof is that thousands of imitations have appeared." The magazine and its British version frequently reported on her style throughout the following decade. Alongside model Twiggy, Hepburn has been cited as one of the key public figures who made being very slim fashionable. Added to the International Best Dressed List in 1961, Hepburn was associated with a minimalistic style, usually wearing clothes with simple silhouettes which emphasised her slim body, monochromatic colours, and occasional statement accessories. In the late 1950s, Audrey Hepburn popularized plain black leggings. Academic Rachel Moseley describes the combination of "slim black trousers, flat ballet-style pumps and a fine black jersey" as one of her signature looks alongside little black dresses, noting that this style was new at the time when women still wore skirts and high heels more often than trousers and flat shoes. In addition to Sabrina, Givenchy designed her costumes for Love in the Afternoon (1957), Breakfast at Tiffany's (1961), Funny Face (1957), Charade (1963), Paris When It Sizzles (1964) and How to Steal a Million (1966), as well as clothed her off screen. According to Moseley, fashion plays an unusually central role in many of Hepburn's films, stating that "the costume is not tied to the character, functioning 'silently' in the mise-en-scène, but as 'fashion' becomes an attraction in the aesthetic in its own right". Hepburn herself stated that Givenchy "gave me a look, a kind, a silhouette. He has always been the best and he stayed the best. Because he kept the spare style that I love. What is more beautiful than a simple sheath made an extraordinary way in a special fabric, and just two earrings?" She also became the face of Givenchy's first perfume, L'Interdit, in 1957. In addition to her partnership with Givenchy, Hepburn was credited with boosting the sales of Burberry trench coats when she wore one in Breakfast at Tiffany's, and was associated with Italian footwear brand Tod's. ↑ On Hepburn's birth certificate her father was stated to have been born in London. This was corrected in 1952 by her mother to "born in Onzic, Bohemia". Onzic is a misreading of Ouzic (German Auschiz), now Úžice in Czech Republic. ↑ Walker writes that it is unclear for what kind of company he worked; he was listed as a "financial adviser" in a Dutch business directory, and the family often travelled among the three countries. ↑ She had been offered the scholarship already in 1945, but had had to decline it due to "some uncertainty regarding her national status". ↑ Overall, about 90% of her singing was dubbed despite being promised that most of her vocals would be used. Hepburn's voice remains in one line in "I Could Have Danced All Night", in the first verse of "Just You Wait", and in the entirety of its reprise in addition to sing-talking in parts of "The Rain in Spain" in the finished film. When asked about the dubbing of an actress with such distinctive vocal tones, Hepburn frowned and said, "You could tell, couldn't you? And there was Rex, recording all his songs as he acted ... next time —" She bit her lip to prevent her saying more. She later admitted that she would have never accepted the role knowing that Warner intended to have nearly all of her singing dubbed. ↑ This was the highest price paid for a dress from a film, until it was surpassed by the $4.6 million paid in June 2011 for Marilyn Monroe's "subway dress" from The Seven Year Itch. Of the two dresses that Hepburn wore on screen, one is held in the Givenchy archives while the other is displayed in the Museum of Costume in Madrid. A subsequent London auction of Hepburn's film wardrobe in December 2009 raised £270,200, including £60,000 for the black Chantilly lace cocktail gown from How to Steal a Million. ↑ 4.0 4.1 Walker 1997, p. 6. ↑ 7.0 7.1 7.2 Spoto 2006, p. 3. ↑ 9.00 9.01 9.02 9.03 9.04 9.05 9.06 9.07 9.08 9.09 9.10 9.11 9.12 9.13 9.14 9.15 Paris 2001. ↑ 13.0 13.1 Walker 1997, p. 8. ↑ Spoto 2007, p. 8. ↑ 25.0 25.1 Woodward 2012, p. 52. ↑ Woodward 2012, pp. 50–52. 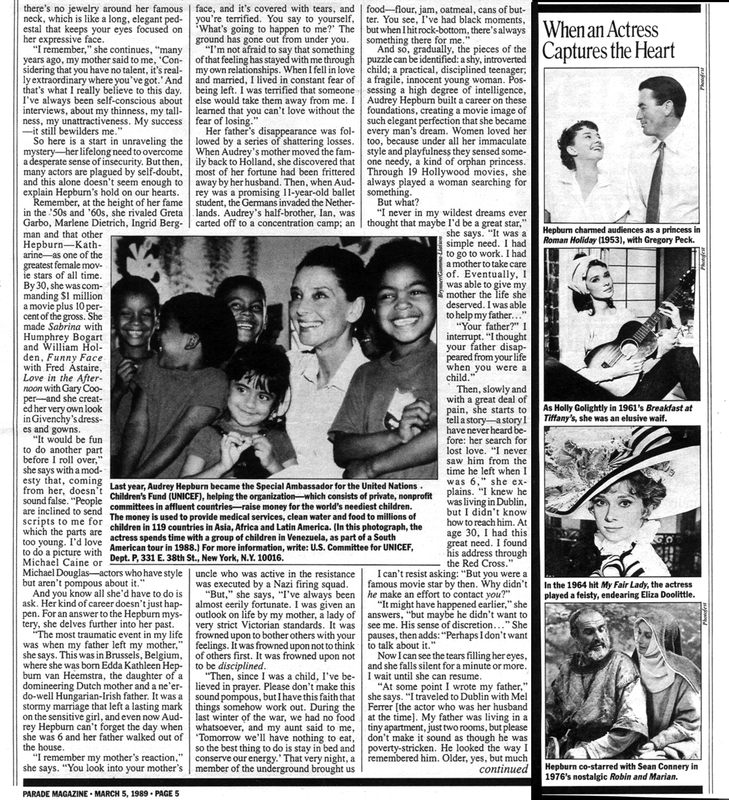 ↑ Kogan, Rick; The Aging of Aquarius, Chicago Tribune, 6/30/96, michaelbutler.com. Retrieved 15 January 2010. ↑ News Service, N.Y. Times. (25 January 1993). "Hepburn buried in Switzerland". Record-Journal. p. 10. ↑ 119.0 119.1 Hill 2004, p. 78. 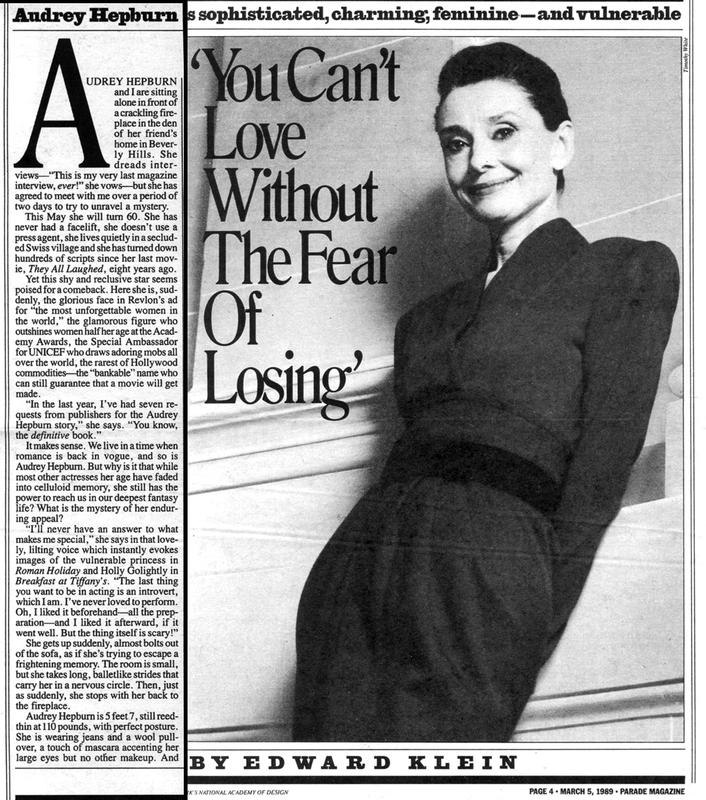 ↑ Regard sur Audrey Hepburn, Regard Magazine n° 4, Paris, January 1993. ↑ Christie's online catalog. Retrieved 7 December 2006. This page was last modified on 5 May 2017, at 12:25.